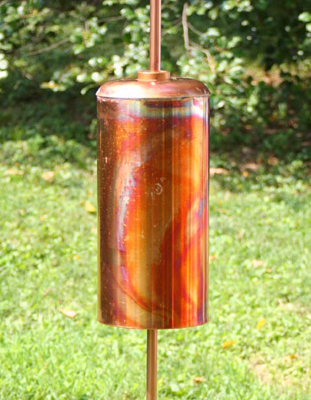 A Celebrity feeder in Gold, Moss & Mauve with the Post Conversion Kit and Squirrel Baffler in a Lexington, KY garden. This Copper Squirrel Baffler is a real work of art. 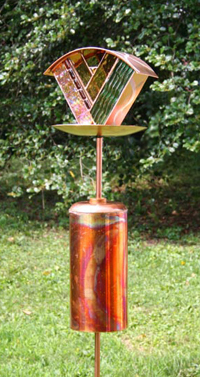 I make the top and sides from solid copper, then I torch colored swirls on the sides. The Squirrel Baffler works great with all my post feeders. Some squirrels may be able to climb up the post, but my Squirrel Baffler blocks them from reaching the bird feeder above! Easily installs on the post with a screw driver.